French Toast is one of those breakfast dishes that doesn't really need a recipe. Slices of bread are simply dipped in a mixture of beaten eggs and milk and then fried in butter until the outsides turn a nice golden brown color with crisp edges, while the insides remain wonderfully soft. Depending on were you live, you may know French Toast as Bombay Toast, German Toast, Spanish Toast, Nun's Toast, Poor Knights of Windsor, Pain Perdue, Portuguese Toast, Arme Ritter, Arme Riddere, Torriga, or Egg Toast. This French Toast recipe is very accommodating. You can add spices to the eggs and milk mixture; like cinnamon and nutmeg, vanilla extract, orange or lemon zest, or even orange flower water. A splash of rum, brandy, or other liqueur is favored by some and while you can use milk, others prefer cream or even buttermilk. Betty Rosbottom in her cookbook "American Favorites" even suggests using eggnog during the Christmas season. When it comes to what bread to use, again, there are many choices. The days of using that squishy white processed breads are over. Today, we use fine breads like French, Italian, Egg, Rye, Panettone, Brioche, Croissants, Sour Dough, Whole Wheat, Raisin, and even Banana Bread. The important thing is to use day old bread so that it will soak up the egg mixture yet not fall apart. Once you have cooked the French Toast there is always the question of how it should be served. Many just like to sprinkle a little powdered sugar over the top while others like it with pure maple syrup. As a brunch dish, serve with maple syrup along with fresh berries, slices of peaches or bananas, or even sliced apples that have been sauteed in a little butter, sugar, and ground cinnamon. Yet another idea is to spread your favorite jam over each slice and, if you are feeling indulgent, top with a little softly whipped cream or clotted cream. French Toast is also excellent with berry sauces; sauces such as Blueberry, Strawberry, or even Raspberry, with or without fresh berries on the side. 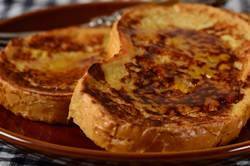 French Toast: In a large bowl whisk together the eggs, milk, salt, vanilla extract and ground cinnamon (if using). Transfer the egg mixture to a large shallow glass or ceramic dish. Dip both sides of each slice of bread into the egg mixture. Meanwhile, in a large non-stick frying pan, over medium to medium-high heat, melt about one tablespoon of butter. Fry the slices of bread until golden brown on one side and then turn and fry the other side. If not serving immediately, keep warm in a 250 degree F (130 degree C) oven. Continue frying the other slices of bread, adding more butter as needed. Serve immediately with a dusting of powdered sugar and pure maple syrup or fresh fruit. Preparation time 10 minutes. Mariani, John F. 'The Dictionary of American Food & Drink'. Ticknor & Fields. New Haven: 1983. Simon, Andre L. and Howe, Robin. 'Dictionary of Gastronomy'. The Overlook Press. New York: 1978.